The timing belt keep your engines camshaft moving efficiently and precisely. 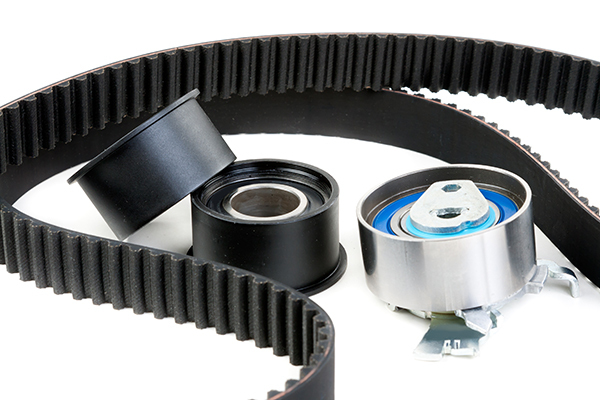 Most belts are visible, but your vehicle's timing belt is hidden behind the timing belt cover. All belts over time will degrade and since the belt is not visible will need to be serviced as per your vehicle manuals specified schedule. If your timing belt breaks or slips a gear do to degradation, your engine will no longer move in sync and this could cause major valve or piston damage. If you hear squeaking or unusual sounds coming from the timing belt cover it is probably time for service. If the timing belt breaks your engine will not start. In most cases the water pump will need to be changed when the timing belt is replaced. Replacing the timing belt at the vehicle's reccomended service schedule will cost money, but not as much as a new engine or new car if the engines experience catastophic damage due to a broken belt. Our technicians can replace your vehicle's timing belt and do it right. Make an appointment to schedule your timing belt replacement service!